Looking back at the year in cinema in 2014, pills it’s easy to get excited about film-making. Although many argue that television is offering up some of the year’s best entertainment, thumb movies can still be as exhilarating and exciting as they ever were. My two favorite movies of the year, drug for instance, showed that experimenting with the medium can– if properly done– provide extraordinary results. This list of my ten favorite movies of the year includes both big movies that were laden with special effects and technological wizardry (i.e. Interstellar and X-Men: Days of Future Past) and films that were on a smaller scale that told their stories remarkably well (i.e. Whiplash and Still Alice). Of course though, the year in cinema belonged to a small film that over the course of twelve remarkable years chronicled the physical and emotional growth of a boy and his family. With that in mind, here’s my list of the 10 best movies of 2014. 10.) Interstellar: Director Christopher Nolan followed his beloved Dark Knight trilogy with this intergalactic drama about our planet in turmoil and a space crew’s attempt to find another planet for the human race to survive on. 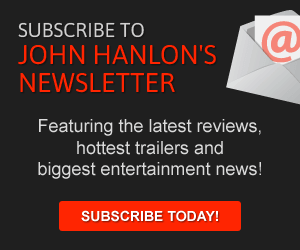 Never one to rely on effects alone, Nolan creates a human drama first (featuring Matthew McConaughey as an astronaut who leaves his family on a mission to space) and then shows the scope of his vision, mesmerizing viewers with his depiction of a deadly but exciting universe that exists within our grasp. Check out my full review here. 9.) A Most Wanted Man: In one of his last performances, Philip Seymour Hoffman delivers one of the year’s best. Adapted from the John Le Carre spy novel, the film focuses on a British intelligence officer’s bid to flip a suspected terrorist and undermine a growing terrorist network. Le Carre’s novels have been adapted into films (Tinker, Tailor, Soldier, Spy) and television shows before (The Game) but this adaptation works the best, partly because of its incredible cast featuring Hoffman, Robin Wright and Rachel McAdams. It’s an old-school thriller that relies on intelligent dialogue and realistic plot twists (rather than explosions and unrealistic betrayals) to tell its remarkable story. Check out my full review here. 8.) The Grand Seduction: Like Waking Ned Devine was in 1998, The Grand Seduction is a small but irresistible comedy that was one of the year’s most surprising cinematic gems. Brendan Gleeson stars as a man trying to save his community from utter despair and hopelessness. His town is on the cusp of falling apart with many of its residents relying on their unemployment checks to survive. If Gleeson’s character can convince a young doctor (Friday Night Lights‘ Taylor Kitsch) to serve as the town doctor though, a large corporation will build a factory in the community, providing jobs for dozens of residents. The scope of the film may be small but its charm is undeniable. With mixed reviews and a limited roll-out, the film didn’t that much at the box office but it’s definitely worth checking out on DVD or Blu-Ray. Check out my full review here. 7.) X-Men: Days of Future Past: The X-Men franchise can arguably survive on name recognition alone but in X:Men: First Class (2011), filmmakers reinvented the franchise by showing the characters as younger versions of themselves who struggle with their unique powers. That great film was followed up by this remarkable sequel– featuring both the First Class cast and the actors from the original trilogy– that dared to undermine previous X-Men installments and showed what summer blockbusters can be if filmmakers were willing to take major risks. Check out my full review here. 6.) Still Alice: Featuring an Oscar-worthy performance by Julianne Moore, Still Alice tells the remarkable story of a woman facing a diagnosis of early-onset Alzheimer’s. Heartbreaking but funny, emotional but sweet, the film shows what it’s like for a linguistics professor to slowly lose the skills and lessons she spent her lifetime learning. 5.) Locke: When I originally saw the trailer for Locke, I assumed it was a thriller and that the scenes featuring Tom Hardy in the driver’s seat of a moving car were just part of the action. In actuality, that’s the whole movie. Hardy delivers one of the best performances of the year in a film that centers on his character’s decisions on one of the most important nights of his life. For eighty-five minutes, viewers watch as the character drives along the highway talking on the phone with work associates, loved ones and friends. It’s a movie driven by a concept but writer/director Steven Knight makes the concept works brilliantly, showing how a complex character can be revealed in even the most mundane of circumstances. 4.) 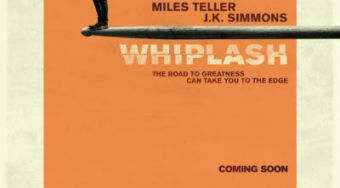 Whiplash: Featuring a career-defining turn by J.K. Simmons, Whiplash is less flashy and extravagant than some of the other films on this list and its story is rather “small” in terms of scope but its reach is wide and undeniable. Miles Teller stars as a student at a music school who faces off against a charismatic but psychotic instructor (Simmons) whose motto seems to be “There are no two words in the language more harmful than good job.” It’s a remarkable and compact story that will leave viewers debating its characters and how far one should go to succeed. Check out my full review here. 3.) The LEGO Movie: Expectations are so important when entering a movie theater. When a person walks into a theater expecting greatness only to encounter goodness, his or her expectations have been underwhelmed– possibly jading his or her cinematic entire experience. That’s one of the reasons I try to go into films with low or no expectations. Still, it was hard to be excited about a movie that was so obviously aimed at selling toys. Boy, was I surprised. Directed and written by Phil Lord and Christopher Miller, The LEGO Movie was funny, smart and original. For most of the year, it was my favorite movie of 2014. 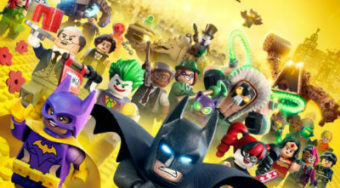 It’s ranked here as my third favorite but it’s still the movie that showed me that any concept is rife for brilliance and even if a movie is partially aimed at selling toys, it can still be “awesome.” Check out my full review here. 2.) 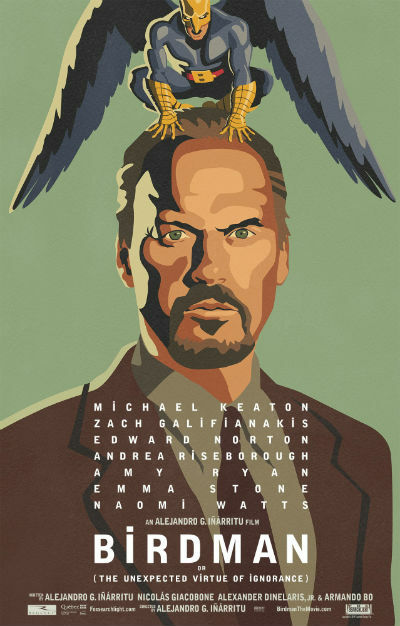 Birdman (or the Unexpected Virtue of Ignorance): Birdman is one of the most exciting and electrifying films of the year. Not only does it feature Michael Keaton in a role that seemed destined for him but it also features an amazingly energetic score that keeps the viewer captivated as the main character seeks to reinvent his career. Much of the attention for this feature has focused on the fact that it looks like the movie was filmed in one take. It wasn’t but that doesn’t matter. This movie offers so much more to the big screen than “style.” It’s a biting, beautiful and fantastical critique of the superhero genre, the method actor and the comeback culture we live in. Check out my full review here. 1.) 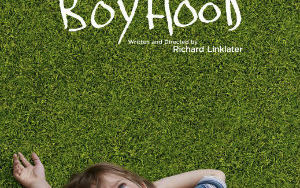 Boyhood: Director Richard Linklater, working alongside a cast featuring Ellar Coltrane, Patricia Arquette and Ethan Hawke, has made a movie here that seeks to capture the slow but undeniable growth that a boy– and his loved ones– experience over the course of twelve years. Instead of dwelling on some of the most obvious moments in the main character’s life (his first date, getting his driver’s license, his first job), the director focuses on the smaller but more defining moments (bowling alley visits with Dad, discussions with Mom about a haircut) of his youth. There is something undeniably remarkable and unforgettable about a movie that tries to bring the concept of growing up to the big screen and actually succeeds. Check out my full review here.